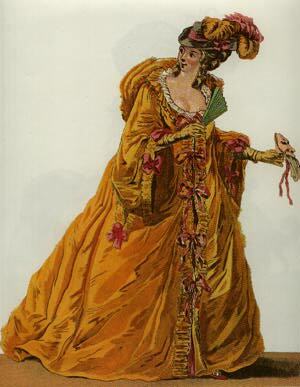 This image is from the Galerie des Modes, a French fashion journal c. 1778-1787. Note the feathered evening hat. In Isabelle de Charriere's 1782 Letters from Mistress Henley, Mistress Henley and her husband argue over her wearing such a hat to a ball. Such a hat is also seen in the famous Gainsborough, Hon. Frances Duncombe c. 1777, now used as the cover picure of the Oxford University Press edition of Frances Burney's Cecilia (1782). Fig. No. 1.--An Eygptian Costume.-- The head-dress is composed of a rich handkerchief of white lace, which crosses the back part of the head; each corner of the handkerchief, a small distance from the shoulder, falls on the front of the neck; the handkerchief is trimmed round with a magnificient border of peals, and each corner is finished with a bunch of the same; the hair is curled on the top of the forehead with small thick curls, separated with a band of diamonds, which crosses the forehead, and continues round the head; two small curls down the side of the face. A rich white figured sarsnet dress made with a short trian, and scollope back; sleeves very short and covered with a broad flap of white lace; the undersleeve is trimmed round with small French pearls; also the lace, which is fastend to the back part of the sarsnet sleeve with a star of pearls; the front is made full each way, and covered with rich lace fastened in the centre with a star to correspond with the sleeves. An Egyptian trian of lilac spider net, showered with pearls, and worked in the centre with a large star of the same, cut in the form of a half handkerchief, wider a one end than at the other; one end is cut square, and gathered up full on the left shoulder with a pearl star; a piece of sarsnet, from under the left arm, richly ornamented, crosses the front, and is fastened with the middle corner of the train to the right knee with a bunch of pearls; the other corner, which reaches to the bottom of the dress, is finished with a large pearl tassel; the dress and train are trimmed round with pearls to correspond. White kid gloves and shoes.